Oh this salad is delicious is one of those dishes when you prepare them you can’t stop picking on them! This salad is full of goodness and nutrition! 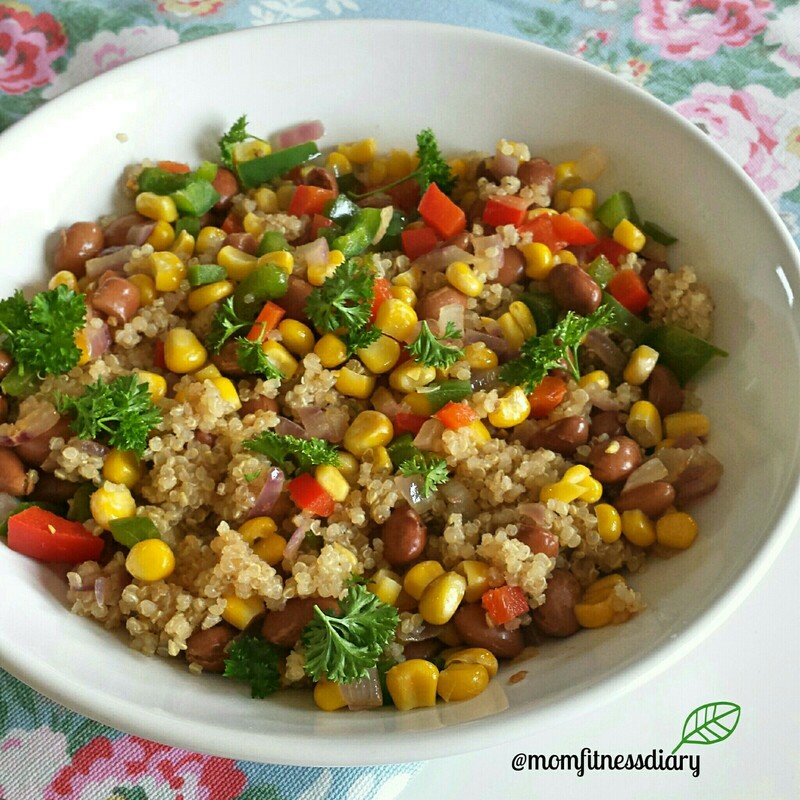 Quinoa, beans and sweet corn are an excellent source of carbohydrates so if you are trying to lose fat you have to measure it. So Measure 1/2 to 1 cup of the above mixture if you are a woman and 1-2 cups if you are man. With twice the protein content of rice or barley, quinoa is also a very good source of calcium, magnesium and manganese. It also possesses good levels of several B vitamins, vitamin E and dietary fibre. Cooked quinoa seeds become fluffy and creamy, yet maintains a slight crunch. It has a delicate and subtly nutty flavor, versatile for breakfast (as a cereal), lunch (as a salad) or dinner (as a side). Quinoa is among the least allergenic of all the grains, making it a fantastic wheat-free choice. Like buckwheat, quinoa has an excellent amino acid profile, as it contains all nine essential amino acids making it a complete-protein source. Quinoa is therefore an excellent choice for vegans who may struggle to get enough protein in their diets. Place quinoa in a saucepan doubling the amount of water on it. So If you are cooking 1/2 cup of raw quinoa add 1 cup of water. For 1 cup of quinoa add 2 cups of water. Bring it to the boil. Once boiling add a chicken or vegetable stock cube. Put a lid on it bring heat to the lowest setting and cook for 10-15 minutes or until water has evaporated. If you cook over cook it it can become mushy so be careful not to over do it! Chop up vegetables, and mix everything together. Season with sea salt, black pepper, garlic salt and fresh parsley. I served with salmon fillet and it was absolutely delicious, healthy and very filling! I also had a big leafy salad with it! page. I wound up in your weblog right after researching physical fitness connected issues on Yahoo guess I lost track of what I had been performing! Anyway I'll be back as soon as again within the potential to verify out your blogposts down the road. Thanks! This was a genuinely extremely superior publish. In theory I'd wish to create like this also – getting time and actual effort to make a excellent piece of writing but what can I say I procrastinate alot and by no means appear to obtain some thing done. the foods looks attractive and delicious. I think it will nutri for kids. thank you for your share. Fitness Model at Workout Music Motivation videos. The food is very delicious! I will make it. Thanks for your instruction! Cook at weight watcher recipes free online foods. Wow, amazing recipe. Im going to try this at home, i hope it helps with my weight loss journey. i am also going to take garcinia cambogia to help speed up the weight loss process. Great blog! Keep it up!